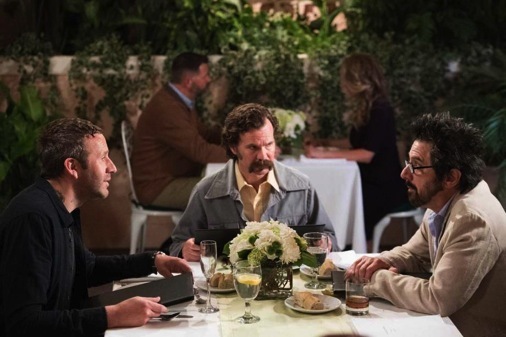 Epix’s spanking new Get Shorty series comes from good bloodlines and has ample bloodletting amid its hard and soft toss one-liners. It’s otherwise “re-imagined” in what turns out to be the best sense of that lately over-used word. The barest of basics are retained from the late Elmore Leonard’s 1990 novel and a well-played 1995 feature film. Otherwise all of the characters’ names are changed except “Shorty,” which is used in a completely different context. Premiering Sunday, August 13th on Epix, Get Shorty is intended to be the premium cable network’s bold effort to stamp itself with a signature show after less than optimum results with Graves and Berlin Station. The first six hours from Season 1’s 10-episode order were made available for review. And they’re really quite something, with Chris O’Dowd (The IT Crowd) breaking through in a big way as enforcer/hitman/body disposer Miles Daly after John Travolta headed the film cast as loan shark Chili Palmer. That was some cast, by the way. Gene Hackman, Rene Russo, Danny DeVito, Bette Midler, James Gandolfini, Delroy Lindo and Dennis Farina also were included while Harvey Keitel and Penny Marshall had cameos as themselves. DeVito, who played actor Martin Weir, is the Shorty of the 1995 film. In the Epix version, it’s an off-hand reference to Miles’ 12-year-old daughter, Emma (Carolyn Dodd), who still loves her daddy but mostly lives with his estranged wife, Katie (Lucy Walters). Beholden to a bad mama mobster named Amara (Lidia Porto), Miles and his sardonic sidekick, Louis Darnell (a very good Sean Bridgers), are based in nondescript Pahrump, Nevada. It’s home turf for Amara’s Silver Dust casino and her very ruthless drug-running operation. Unpaid debts or tardy protection payments are not tolerated, as is demonstrated early on. But the opening minutes are devoted to Miles and Emma, who emerge from an action movie that she enjoyed and he didn’t. “Dad, it’s in 3D. It’s not supposed to mean anything,” she tells him off-handedly. Right then and there, the sharp writing establishes its first foothold. Miles and Louis are soon sent to Hollywood to collect on a $50,000 debt run up by a struggling screenwriter. This results in a purloined script, among other things, with film connoisseur Miles fated to hook up with producer Rick Moreweather (Ray Romano continuing to expand his drama portfolio). Rick, who once had grand aspirations, has backslid into an unkempt hack whose B-movies invariably go straight to video while also making small profits via overseas sales. Miles is thinking much bigger than that with the stolen and now blood-spattered script for The Admiral’s Mistress, a period piece requiring a substantial budget to meet his grand expectations. Complications kick in when Amara is persuaded to sign on as a minimal investor at first. Miles persuades her that a profit he guarantees can easily be laundered abroad. The grisly fun has only just begun. Get Shorty toggles between Nevada and Tinseltown, with a brief flashback, in Episode 3, to Amara’s traumatic early transition from Guatemala to the States back in 1969. The action otherwise is in the here and now, as The Admiral’s Mistress gains traction via deceit, the blackmailing of a studio executive (Megan Stevenson as April Adams) and other forms of strong-arming when necessary. Miles, who’s not quite as nonchalantly brutal as the oft-dense Louis, has his eyes on the prize of becoming respectable in hopes of winning back his wife and daughter. But Amara’s jealous, cutthroat nephew Yago (Goya Robles) would much rather see him dead. Mobster Amara also has a very strong affection for the work of John Stamos, with Episode 4 subtitled “From Stamos with Love” for reasons that prove critical to Miles’ survival. There’s no obvious weak link among the featured cast members, although Romano’s recurring use of the word “Yeah” to begin or end sentences is a familiar remnant from both his standup act and his signature sitcom role as Ray Barone. In a manner of speaking, he should be aware of this by now and strive to act accordingly. Then again, perhaps that’s too much of a nitpick. The star-making turn in Get Shorty clearly is from Chris O’Dowd, whose efforts to curb his violent tendencies are akin to a heavy smoker trying to quit. He also flexes a high-appeal softer side in a performance that registers both physically and comedically. This is a guy who definitely shouldn’t be crossed, but also a man of taste and hardscrabble refinement. Porto’s Amara, her forelock resembling a prime surfing wave, is also a force throughout, but with rougher edges. In short, a lot is very right with Get Shorty, which may well come calling again during next year’s awards season. Hulu finally landed its first signature series this year with an adaptation of Margaret Atwood’s The Handmaid’s Tale, which likewise spent years in waiting following a decades ago feature film. Epix very much hopes that this lightning will strike again. And purely on the merits, it should.